I’ve made homemade graham crackers AND homemade marshmallows, so you know where I’m headed. Yup, you’re usually one step ahead of me. S’mores. From almost entirely homemade ingredients. Does it get better than that? I didn’t think so. For those of you that have somehow been deprived of the amazing invention known as s’mores, these impeccable little treats consist of chocolate and toasted marshmallow sandwiched between two pieces of gram cracker. The residual heat from the melty marshmallow melts the chocolat ever so slightly and causes everything to gel together in a magical way. You don’t really need a recipe for S’mores, but I’ve got a few ideas for you in case your winter set-up doesn’t include a fireplace. You can toast the graham crackers topped with a few marshmallows in a toaster oven or under a broiler until just starting to melt. Remove, top with half a chocolate bar and another piece of graham cracker. Or, you could assemble the whole thing and throw it in the toaster oven for a minute. I also have memories of us city kids roasting marshmallows over the open gas flame of our ovens, but not sure if that’s actually a good idea… Anyone ever tried microwave s’mores? For this week’s blog hop I want your favorite DIY recipes! Any items that are regularly store bought are fair game. Do you make your own limoncello or mustard, pickles or potato chips? Link up here! These look fabulous! Smores are probably the greatest food ever – and you homemade the ingredients! I am sooo impressed. Since getting a mandolin, I enjoy homemaking potato and veggie chips. I’ve also experimented with homemade beef jerky, which was delicious. Happy Friday! Thank you Dara! I am so impressed with all the things you’ve made with your mandolin! Very cool. Thanks Theresa! They made really nice holiday gifts. I even managed to get them from Israel to New York in one piece! These were perfect 🙂 and inspirational to make my own!!! Thanks for sharing them! Emanuel and I loooooved them. Yum yum! This would be dangerous! Haha that’s why I had to give them away! If I hadn’t just eaten lunch, I would be starving for one of yours smores! I need to go back and look at the marshmellows. I guess I missed those. Shame on me! Looks absolutely delicious! 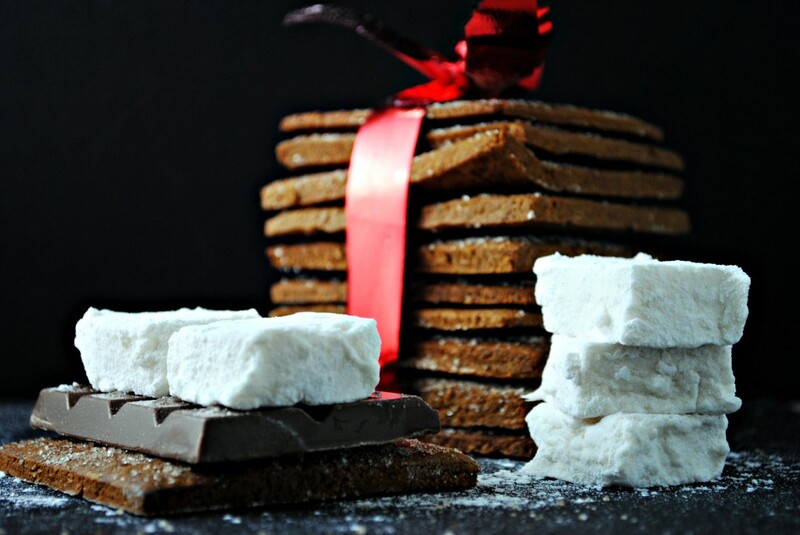 Awesome roundup of links in your bloghop and the smores look awesome! Thanks so much Averie!! I am blown away by the great links in the hop too. Uh Yum! I so have to make these. I made homemade marshmallows for Christmas, so much better than those gross ones that come in the package. I can’t wait to add my new treat to your linky party. Thanks Lisa! So glad you linked up – I’ve always wanted to try making croissants! Oh yum! The s’mores look divine! Great link party here Katherine! You smores do look like an awesome treat. Homemade looks definitely the best way to go-yum! Never had a smore in my life, but I’d love to eat one of these! Oh, Giulia, you are missing out! Shannon you are totally missing out! They’re the best! And yes, yay for DIY projects! I had my very first smores last year with my kids. 🙂 I heard of it before but just never grew up with it. It was delicious but I have to say yours look and sound much much better. =) Everyone’s recipes are amazing. I enjoyed browsing their recipes too! That is so great you had your first s’more! Aren’t they great?! These look absolutely delish! Thanks for sharing! I love s’mores and I really love your homemade version! I’ve been wanting to try to make marshmallows for years, just haven’t got around to it. Great blog hop too! Thanks Alyssa! I had making marshmallows on my list for years too and finally did it! I’ve always wanted to do this. Homemade graham crackers are one of my favorite things on earth. Thanks for the recipe! You are so welcome! I hope you give them a try! I was wondering if you were headed here! And indeed you are. Great pictures.